This intersection was identified in the Milton Comprehensive Transportation Plan (CTP) as a key intersection improvement. This project consists of public involvement, concept development, preliminary/final design construction plans, right-of-way plans, and construction of intersection improvements. 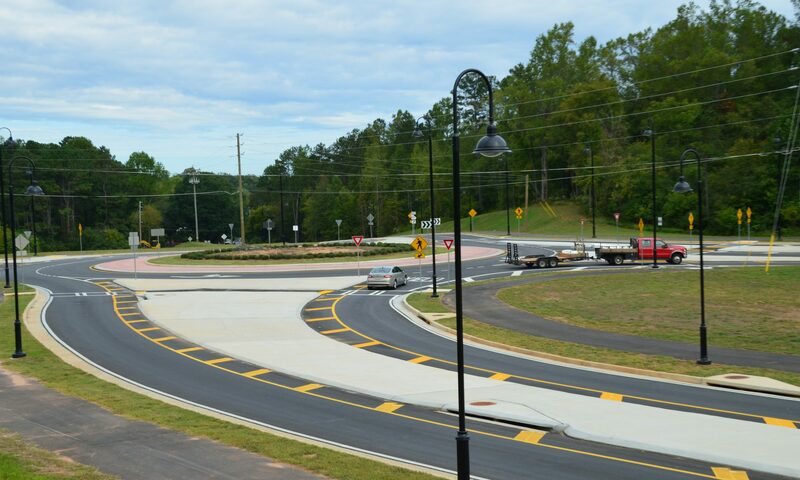 After the public involvement period and concept development, the roundabout alternative was selected as the recommended alternative for intersection improvements at this location. Public Involvement is complete. A Public Information Open House was held on November 14, 2012. Traffic simulations are available at the links below. These simulations are based on 2012 traffic volumes to compare all alternatives. These are AVI files and will play using most media players. The files are very large (between 20 and 35 MB) and may take some time to download or play. These simulations were available for viewing at the Public Information Open House. Concept Development phase is complete and includes data collection, traffic analysis, improvement scenarios, project survey, concept plan, public outreach findings, and recommended alternatives. Click HERE to view the final concept report. Construction Plans and Right of Way Plans have been developed and all right of way and easements have been acquired. Final Right of Way Plans (5 MB) and Final Construction Plans (33 MB).